Great Lathe Cottage has a wood burning stove, games room, hot tub, great views, and sleeps 9 people. What's not to like? Great Lathe Cottage is a lovely holiday cottage to spend your holiday. Sleeping 9 people, Great Lathe Cottage whould ideally suit friends or family who wish to holiday together; or for people who want a little more space on their holiday. There's several reasons you may want to choose Great Lathe Cottage for your next cottage holiday: for starters, there's the size of the cottage; Great Lathe Cottage sleeps 9 people in 4 bedrooms - so certainly isn't small. There's also a wood burning stove here; you really can't beat a wood burning stove during a winter break. Light the fire as the sun starts going down, and enjoy a cosy night in; there's a games room too - which includes a pool table. Ideal to keep any children happy while you enjoy the peace and quiet. And there's those rural views - and what views they are. During the summer you can sit outside and drink in the rural surroundings of Great Lathe Cottage. Or, sit in the hot tub and enjoy the views - oh yes, didn't I mention this before? Great Lathe Cottage has a hot tub. Whether you're looking for a winter or a summer break, you've just got to spend some time in the hot tub. That was just a few reasons why you might like to spend your holiday at Great Lathe Cottage. Oh, and Great Lathe Cottage has Wi-Fi too - so you don't have to lose your connection to the internet during your holiday here. Of course, you may want to leave Great Lathe Cottage behind for a couple of hours, and see what there is going on in the area. The Cinque Port town of Hythe is just down the road; or you could head a few miles further and visit the old city of Canterbury; or, maybe even a trip to Port Lympne Wild Animal Park could be something for you. With Dover and Ashford being so close, you might even want to nip across the channel to France for the day. You may, however, decide that all that is just too much like hard work, and instead spend your time in the hot tub! Should a holiday Great Lathe Cottage take your fancy, you'll find holidays start on a Friday here; and short breaks are available all year. 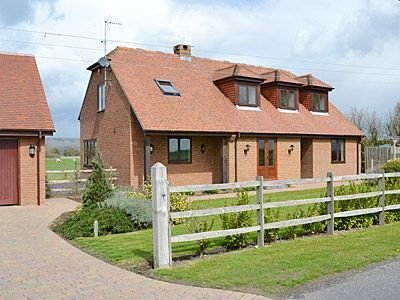 Should Great Lathe Cottage not be to your liking, but you fancy staying in the area around Dymchurch, you might well be interested in the cottages below. All these cottages are within a few miles of Great Lathe Cottage.